Fun Surf Camps for kids aged 8-16. During Easter & Summer School Holidays. Camps run 10am-12pm Monday to Friday. All equipment provided. Surf Lessons for adults and kids. Lessons run daily at 10am and 2pm. Group discounts available. All equipment provided. Come surfing on the East Coast of Ireland - we're only 30min from Dublin! 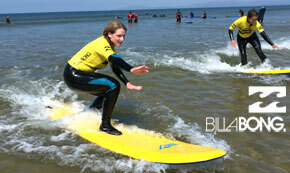 Brittas Bay Surf School is the first dedicated surf school on the East Coast of Ireland. We are based between the North and South Carparks at Brittas Bay Co. Wicklow and provide a friendly, safe and fun introduction to the exhilarating art of surfing. Our private surf school entrance provides FREE and SAFE parking. Just follow the Billabong flags and Brittas Bay Surf School signs! See map. With over 26 years of experience, our surf school is ISA (Irish Surfing Association) approved, fully insured with qualified local surf instructors and beach lifeguards. Our surf lessons, kids surf camps, SUP lessons, school surf tours, group surf lessons and watersports for teenagers run daily and we cater for kids and adults of all surf and fitness levels. We are proudly sponsored by Billabong.